Here it is, November 4 already. This 9 of Wands is the sixth one in a row which we have seen. Another Wands card, another song. 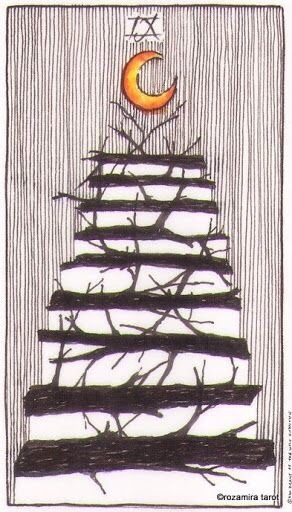 Today, I am humming ‘Eye of the Tiger’, and I am loving this unusual depiction from the Wild Unknown Tarot, which looks much like a ladder or a very difficult series of steps, similar to those of the Philadelphia Museum of Art made famous by the ‘Rocky’ franchise of movies. The Wands cards represent change, fire, and often an unyielding passion to follow the changes at any price. Change does not come easy, but I am certain you would agree that you have come much too far to quit now. The 9 of Wands is a card of persistence and determination, rising up and continuing the fight, no matter how worn and tired you may be. The changes are happening because you are making them happen. You have a great deal for which to be thankful now, and you have surely developed a new sense of your capabilities when it comes to survival mode. There is a popular saying, “You never know how strong you are until being strong is the only choice you have”. Many people out there have this emblazoned in the permanent form of a tattoo, and though you may not wish to run out and get one, you can certainly relate. This has been your life for far too long. You have the stamina now to reach the top of those steps, and soon you will be able to exhale. Feeling strong now. Looking for more in-depth Tarot Guidance? Follow me on Patreon. Become a Patron by pledging $2 per month or more, for exclusive access to monthly readings by zodiac sign, as well as New Moon, Full Moon and retrogrades. This entry was posted in Card of the Day, Full Moon, General Tarot, Love and Finance, Patreon, Readings, YouTube Videos and tagged 9 of Wands, Card of the Day, Guidance, Path, Reading, Tarot.